If you are looking to explore the North York Moors in North Yorkshire, then the GB Discoverer North Yorkshire Moors 1:25 000 scale map is the perfect map to use with your compatible Garmin system. North Yorkshire Moors OS map on SD includes: coverage of loops from Mount Grace Priory to Guisborough, to Whitby, to East and West Ayton, to Pickering, to Coxwold. If you've ever seen the television programmes 'Heart Beat' or 'The Royal' then you will be familiar with the land and seascapes of this area. Whether you are looking for a bracing cliff top walk or the solitude and stark beauty of the moors, both this map and/or the Clevland Way map will assist you on your vacation From the bustling Victorian grandeur of the seaside resort, Scarborough, to the quaint Robin Hood's Bay, or a trek across the Moors or a trip on the North York Moors Heritage Railway line, these maps are ideal when used with your compatible Garmin device. Explore and navigate the North Yorkshire Moors with confidence using this genuine Garmin GB Discoverer map which comes supplied on SD card. Simply insert the microSD/SD card into your compatible Garmin unit and you are ready to walk, hike, ride or hack the North York Moors with an OS map at a scale of 1:25K - as recommended by Ordnance Survey for outdoor activities. North Yorkshire Moors GB Discoverer map covers the shaded area number 12 on the UK map below and includes: coverage of loops from Mount Grace Priory to Guisborough, to Whitby, to East and West Ayton, to Pickering, to Coxwold. 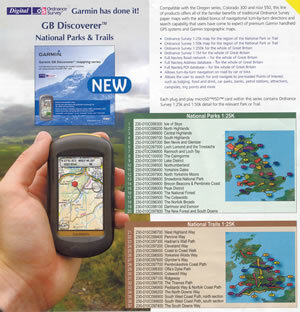 When inserted into a compatible Garmin device the GB Discoverer North Yorkshire Moors maps provide Ordnance Survey (OS) maps at a scale of 1:25 000 for the entire National Park. Plus a 1:50 000 scale map for the same area and slighly beyond that area. The map data is the same as the scale found in the OS Explorer Map series (same as the OS orange cover paper maps ). 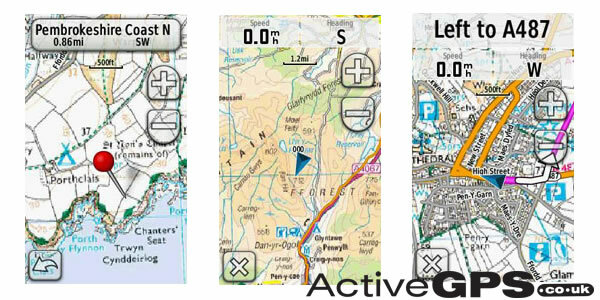 Rather than having folding paper maps to deal with, OS maps are all on your Garmin screen and in the palm of your hand. Please note: The images above are screen shots from various GB Discoverer maps and NOT necessarily from the North Yorkshire Moors map. Mapping for North Yorkshire Moors comes supplied on a microSD inside a larger SD card adaptor. To install insert either the full size or microSD card (depending on your model) into a compatible Garmin GPS device (see compatibility list above). 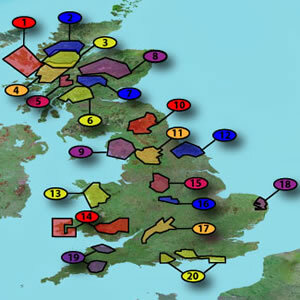 Question: Please can you correct you catalogue name of the map from "North Yorkshire Moors" to "North York Moors"? This is the correct name for the National Park. 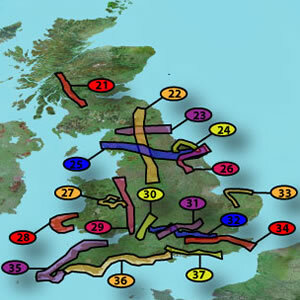 Answer: It is Garmin who name the map 'North Yorkshire Moors'. We simply use the same description on our website. This is to ensure that when a customer receives their purchase from us, it matches what they purchased on our website. 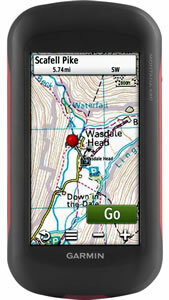 Do you have a question about the Garmin GB Discoverer 1:25K Maps of North Yorkshire Moors microSD/SD card? Submit your question via our contact page. The North Yorkshire Moors Garmin GB Discoverer 1:25K map (010-C0979-00) covers just a small area of Great Britain. However, you might like to consider an alternative Garmin GB Discoverer Ordnance Survey (OS) map covering a larger area which is listed below.